As a specialist in this field, we offer our respected patrons a precision-engineered array of Rubber Molded Bellow. Known for its high load tolerance capacity & strong gripping power, the offered molded below is manufactured with superior quality rubber and leading technology. 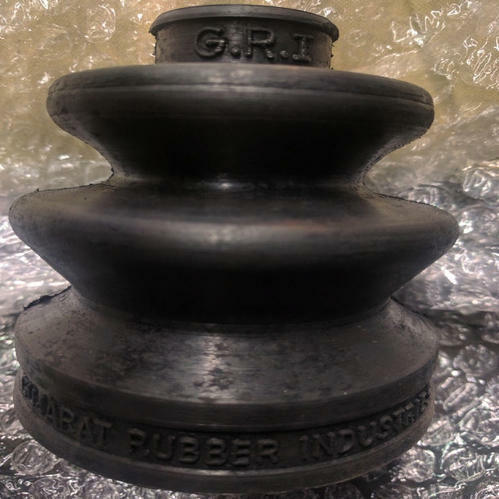 Incorporated in the year 1993, we “Gujarat Rubber Industries”, are the trustworthy Manufacturer, Exporter and Supplier of an enhanced quality Rubber Roller & Pulleys, Rubber Molded Gaskets, Rubber Molded Sheets, Rubber Mountings, Rubber Molded Parts, Rubber Cords & Strips, etc. Our offered products are manufactured with the help of finest grade elastomeric material derived from petroleum by-products. These products are widely demanded in automobile, printing and textile industries for tires, doors, hoses, belts, matting, flooring and damping sound. Further, our offered products are highly appreciated by our clients for their enormous features like chemical resistance, excellent thermal stability, mechanical performance, flexibility, finely finished, unmatched quality and durability. We have a dexterous team of processional who assist us in coming across the exact needs of our clients and design these products with perfection in predetermined time-frame.